A. Carson got the telescope of his dreams, thanks to a $25 Craigslist find. B. Kate now changes into her dress-ups approximately 30 times a day. 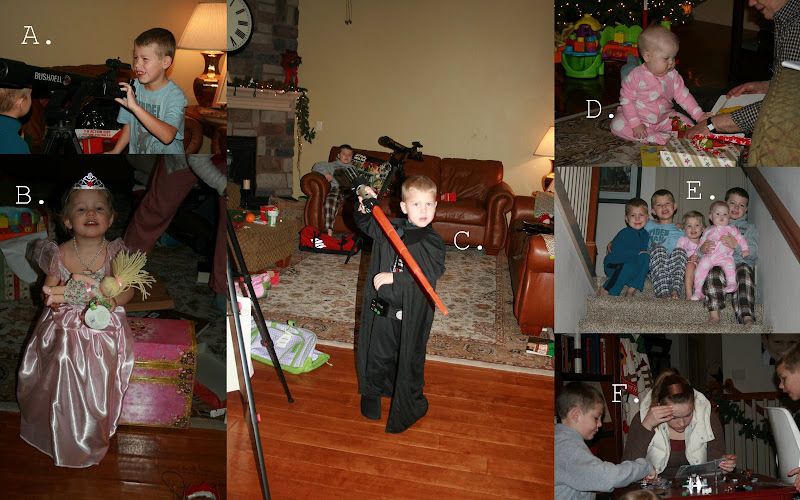 C. Who asks for Darth Vader gloves, costume, sword and mask for Christmas? Baden, that's who. D. Clara didn't express much emotion opening up her gifts after her morning nap. I guess books aren't very exciting. E. Traditional top of the stairs picture of the children before the mad dash to see what Santa brought. Would you believe that we had to wake them up at 8 o'clock? Mom and dad couldn't stand it any longer. F. Chandler got all the Lego Star Wars he can handle. I don't expect to hear any "I'm bored" complaints from here on out. Aunt Kendra is the best aunt ever. She spent 4 hours! putting together the Legos with the boys. She didn't know she had it in her. When we found that my parents and Brian's parents weren't going to be around for Christmas I called up my grandparents and invited them to come. They agreed to come and I am so glad. It was such a treat for us to have them and my aunt with us. We had the best time. One of my favorite Christmases to date. This is Grandma and Grandpa discussing the rules of semi-colons and such as they proofread Grandma's personal history Christmas Eve. My Aunt Thomasene was always helping to pick things up around the house and kitchen. When she finds a need she gets is done. It was so nice! Now I'm ready to take down the decorations and ring in the new year. By the way, Clara is 8 months old today. 8 months! I hope your new years are great. What a fun Christmas!! One day you'll look back and wish your kids would stay in bed until 8 Christmas morning:) Five and six come way too early.